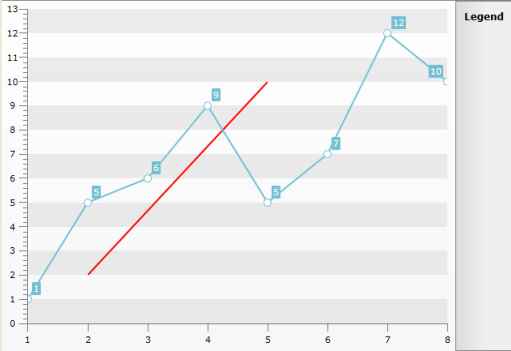 The Custom Line annotation allows you to place a straight line at a specific place in your Chart Area. In order to place the Custom Line you have to add a CustomLine object to the Annotations collection of the ChartArea. You also have to use its__Slope and YIntercept__properties. You can place more than one CustomLine in your ChartArea. In order to define the line you have to set the Slope and/or the YIntercept properties. The function which draws the custom line is y = mx + b, where 'm' is the Slope and 'b' is YIntercept. The Slope is defined as the ratio of the rise of the line (i.e. how much the line rises vertically) to the run of line (i.e. how much the line runs horizontally). After solving it you will get the following values 2.66 for the Slope (m) and -3.32 for the YIntercept (b). If you set these to the respective properties of the CustomLine, you will see the desired line appear. Note that this line will cross the entire ChartArea. If you want only a specific part of it to appear, you have to define the clipping points by setting the MinX, MinY, MaxX, MaxY__properties of the __CustomLine. Their values should represent values somewhere on the respective axis.